I’m sure you’ll agree that the interwebs is swimming with free content. But the reality is that some of it is great and the rest really is not. So how do you know what’s worth your time? In today’s post, I’ve pulled together 8 great free resources for freelancers and business owners. These are particularly great for those just starting out, they’ll help hone your skills, figure out your niche, and what to look for in contracts just to name a few things. So lets get to them…. This free copywriting guide walks you through writing for every type of social media. And while it is geared towards social media copy, the lessons learned like crafting compelling headlines can be applied across all copywriting. I became self employed because of Gina Horkey’s course 30 Days or Less to Freelance Writing Success, so I’m a big fan of hers. While the course isn’t free, she does offer a list of over 200 Freelance Writing Niches to help you get started with freelance writing. Because if you try to write for every subject, you won’t get very far, but if you hone in on a particular niche - your specializing will help you to rise to the top. She’s also doing a giveaway to help you start your Virtual Assistant business, with over $700 worth of courses, tools, and resources. You can enter here, but hurry it ends Feb. 28th! Speaking of being a virtual assistant, Gina also offers another great free resource - a list of 150+ Virtual Assistant Services to offer. If you’ve been thinking of becoming a virtual assistant but are not sure what kind of services to offer, or perhaps what skill you have that you can monetize - then definitely check out this guide. Head over to Gina’s site to get her list of 150+ VA Services. 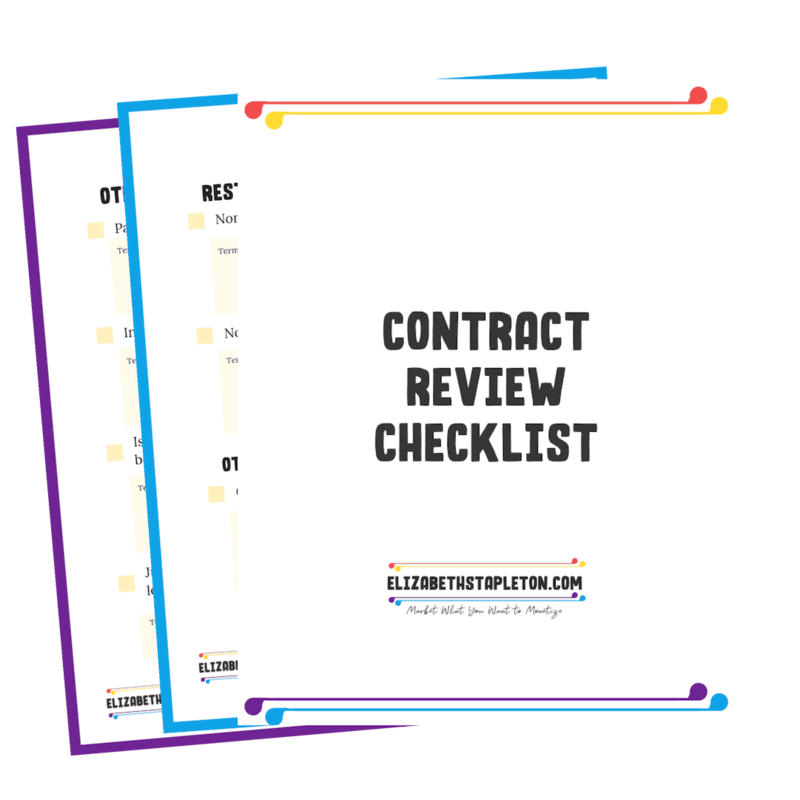 It’s a checklist/worksheet to help you take note of important parts of the contract and make sure you’ve reviewed and understand everything. The Rebel Boss Summit is a virtual summit that is happening Feb. 26-28th 2019. It’s all about teaching how to create and sell a profitable digital product. I’m super pumped to get to be part of it, covering the legal aspects of selling your own products and I can’t wait to learn from the other speakers. So if you’re tired of not earning more or feel like you’ve maxed out on your time for your business, check out this free summit. It will help you create a very scalable business. Register for the Summit for FREE here. If you missed the summit - or just can’t attend when it’s live you can grab an All Access Pass, it’s $97 once the summit starts, and $147 after the summit ends. When you’re starting a business there are usually a few start up costs, and there is no end in recommended tools, but those recommendations are not usually made with your budget in mind. I’ve put together a list of the best tools for blogging and running a business based on your budget. I tell you what tools are great to start with and what is worth upgrading to once you can afford it. If you are freelancing or own a business (or likely both) chances are you have a website. If that is the case, you need to have a page on your site covering legal stuff to make sure your site and business are protected. This checklist will guide you through the top 10 things you need to be sure to include on your site’s legal page. If you’ve been in the Freelance game a while chances are you’ve thought about starting a limited liability company or some other corporate entity to protect your personal assets. Again, while hiring an attorney would be ideal, setting up an LLC is pretty straightforward and this post walks you through it. It also breaks out information on each state’s corporations section - to help you get started in your state. These 8 resources will help you to further your freelance or business and make sure you don’t spin your wheels sorting through all the noise on the internet.